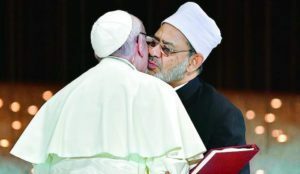 Pope Francis recently signed a pact with Muslims in a possible push toward a one-world religion and declared that diversity of religions is God’s will. But wait. Doesn’t the Bible warn us about unifying with those who worship other gods and have contradictory beliefs on major teachings? God sent His Son to save sinners, but Allah had no son. Isn’t this a problem with anyone else? There are many glaring, stark contrasts between the founders of Christianity and Islam as well as the doctrines themselves. Jesus taught love and forgiveness, and He also instructed His disciples to “pray for those who persecute you. (Matthew 5:44).” But the prophet Muhammad was a violent warrior who promoted conquest, had multiple wives, and killed Jews and Christians – referring to them as infidels and sworn enemies. Look it up. Many gods and spirits exist, but if one religion is true, all the rest have to be false. Does the Bible have anything to say about this? The God of the Bible, Jesus Christ said, “All authority has been given to me (Matthew 28:18).” Islam, however, teaches Jesus was only a prophet. They say He was not God and teach that Jesus did not sacrifice Himself for our sins and die on the cross, nor did He rise from the dead. These are core essentials of the Christian faith! In the document the Pope signed, the word “God” is used to identify both Allah and the God of Christianity. It contains much about peace which is good, but the problems go beyond that. How can we unite with someone that doesn’t agree on who God is? The document is also saying erroneously it is the will of God that there are hundreds of different religions in the world and that they are all acceptable in His sight. No. Diversity of religions and false teachings are due to sin; it’s not God’s will. Another thing the pope did was to declare the Sharia-governed United Arab Emirates the ‘homeland of tolerance.’ Just look at history and news reports and you’ll see this could not be further from the truth. Really? Is this someone we can trust to promote peace and human rights? A man to partner with? Clearly, Islam and Christianity are mutually exclusive. Both claim to be the only true way to God, but both cannot be right. There is no atonement in Islam, no forgiveness, no savior, and no assurance of eternal life. Pope Francis also failed to mention the thousands of Christians dying under Islamic persecution in the Middle East, Africa, Indonesia, and other parts of Asia. Nowhere in the Bible does God encourage joining with other religions. On the contrary, He warns against it, punished the people of Israel for allowing the slightest pagan influence in their camp, and teaches about being set apart. Pope Francis didn’t deny terrorism, but said such “tragic realities are the consequence of a deviation from religious teachings.” Some say terrorism is a result of taking Islamic teachings literally and seriously. Speaking of deviations, let’s discuss a few doctrines that Roman Catholics and Protestants disagree on including the fact Muslims worship Allah, not Jesus. They refuse to put their faith in Jesus alone for salvation, but Muslims are saved “together with us.” Not according to the Bible. Has there been a plan to form a one-world religion all along? Both Islam and Roman Catholicism esteem and honor Mary and call her, “Our Lady.” Mary is mentioned more in the Qu’ran than the Bible. Both seek messages from apparitions of Mary. Apparently, she will return for her children including Muslims, Catholics and Protestants; and people of all religions can be saved apart from Jesus Christ as long as they are good. Both seek world dominion – Both religions rule with an autocratic government and have a history of forced conversions and killing. Both Catholics and Muslims deny the authority of Scripture, the Bible. Both use prayer beads to avoid punishment. Catholics pray the rosary to remit punishment for sin. Muslims use 99 beads that correspond to the names of God. Praying to Allah five times a day is an act of obedience to escape the punishment imposed on those who do not pray. Both have human mediators. Catholics rely on the priesthood to dispense salvation through sacraments and seek Mary to intercede with God on their behalf. Muslims rely on the intercession of Muhammad on judgment day. Both Have a works-righteousness salvation. Allah will place one’s good and evil works on the divine scale: “Those whose scales are light are those who lose their souls in hell” (Sura 23:102,103). In Catholicism, sacraments, good works and obeying the law are necessary for salvation. While there have been many attempts in recent years to find common ground between the two religions, the fact is that stark differences remain. It is misguided to focus on a few common teachings without considering the differences in major doctrines that are diametrically opposed to one another. This is not to say we shouldn’t evangelize people of other faiths, but when it comes to “uniting,” Christians are often the first to compromise, and it’s often biblical doctrine that suffers. Our real enemy is Satan, our struggle is a spiritual one, and we need to stand strong on the word of God. Lord, help us to be more discerning! We know that the powerful and world elites are pushing uniformity and a one world religion, but it’s stunning to see the top world leaders from Catholicism and Islam make such a dramatic display, clearly a sign we’re drawing closer to the end. Interesting times. Be on the alert, friends; watch and pray!